A few years ago, in an attempt to be social and meet other humans, I attended a few – half a dozen or so, probably – episodes of an anime club. It didn’t turn out to be very interactive. The club format was about 5 minutes of one of the officers standing up and talking before starting the night’s program, at which point everyone just sort of watched the screen or played video games in the back until the night was over. So, it failed as a way to meet people, but it worked out pretty well at introducing me to new anime. They had a habit of showing a single episode of a show every week and showing about 8 different programs, so I got to see quite a few different shows – just not very much of any of them. In the years since, I’ve gone back and watched some of these shows from start to finish and they’ve generally been quite good, so whoever was making the programming up did have some taste. Turns out, Stellvia is the space station. So that was a pretty anticlimactic reveal. It was a pretty excellent show, by the way. I realize that I’m nine years late to the party on this but I wanted to put my two cents in. It has a pretty good hook. About two centuries ago, the electromagnetic shockwave of a supernova tore through the solar system, utterly trashing the Earth and killing most everyone. The survivors managed to get back on their feet and learned that, while they’d survived the initial blast of EM, there was a wave of solid debris from the same explosion heading their way. It was travelling much slower, mind you, but it basically meant the extinction of all life on earth. To survive, they put aside the concepts of nations and started a massive space program designed to help humanity survive the “Second Wave”. 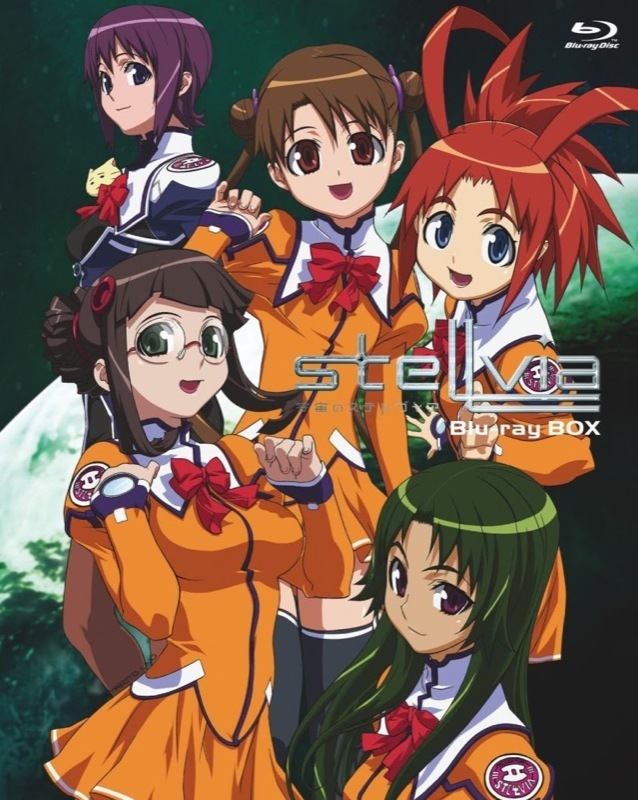 The show kicks off a few months before this Second Wave is due to hit earth and features the main character – whose name is not, as I mentioned, Stellvia – leaving her home on earth to train to become a pilot. She’s, oh man, she’s a bit clumsy and a bit of a crybaby and a terrible pilot but is really good with computers, also there’s a boy that she seems to get along with pretty well. By the end of the third episode, you know how things are going to end. Over the course of a 26 episode series, she’s going to learn to become a great pilot, help save humanity from the second wave while learning lots of lessons about herself, and generally have all kinds of wacky adventures in the meantime. Presumably, she’s going to get the boy and they’ll finally kiss in the last scene of episode 26. It’s the sort of nice relaxed anime where you can just turn your brain off and float along in the comfort zone. Without going too in-depth with the spoilers, everything mentioned above happens by the end of episode 10, at which point someone comments that the whole thing that’s been keeping humanity unified for the last two centuries has come and gone, there’s all these weapons lying around unused now, and oh gosh it’s been a long time since we’ve had a war . That’s the point where I got dragged out of my comfort zone and the show really got its hooks in. The series never actually turns into a grimdark humanity-turning-on-itself sort of story, but it certainly fooled me for a bit. Strongly recommended if, like me, you’ve been under a rock for a few years now and somehow missed it up until now.